Good evening everyone, and welcome to the Car Obsession review of episode 9 of The Grand Tour. 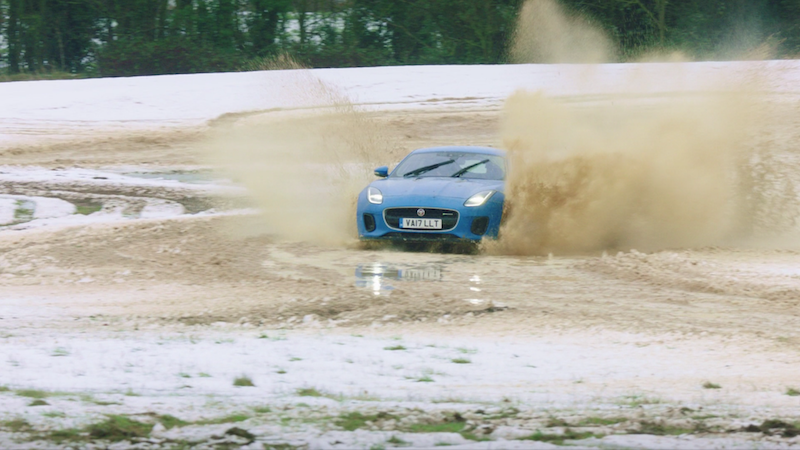 In this week’s show, we see two classic supercars go head-to-head, Clarkson, Hammond and May try to build a record-breaking amphibious boat, plus there are three magicians in Celebrity Face-Off. It looks to be a pretty decent show then, let’s get cracking! We start the show by Clarkson stating that despite impressions, the human race hasn’t actually advanced as much as it thinks it has. His case in point is the fact that modern day supercars are no faster than those made in the early 90s. With that in mind, we cut to Clarkson at the Eboladrome a car I had a model of back when I was a wee boy – the Jaguar XJ220. This, as Clarkson states, was built at a time for an economy that quickly faded away after the stock market crashed. He also states that it was the fastest car in the world, before it was upstaged by the Bugatti EB110, a car that had the twice the amount of cylinders as well as four wheel drive. Despite the extra grip Clarkson describes the car as terrifying, and states that the carpet was made of plastic rather than leather just in case you, cough, soil yourself. So then, you would expect the Frenchmen to make the XJ200 mincemeat in a drag race? Well there’s one way to find out isn’t there? Clarkson pilots the Jag, but before he can ever get going he has to tape up the stereo to keep it in place and then he has to wrestle with the window to get it up. Things are looking for the old Brit, especially as the rev counter had broken, but despite the drag race delivered the result that I had predicted. Clarkson then continues in the Jag, explaining how it has no driver aids and that the only thing to tame the car was him, and it certainly looks like a handful on the track. I still can’t work out whether it looks like the best fun, or one of the most frightening ways to come to a sticky end. The upshot is that despite offering the same sort of speed as modern day supercars, they are simply too terrifying and difficult to drive, therefore today’s supercars are simply superior. Both cars are then taken around the track and although it was wet, the times were far from something to be proud off, further proof that the car world has certainly progressed. The outcome may have been predictable, but it was an enjoyable film nonetheless. Following Hammond’s potentially fatal crash in the Rimac, Clarkson and May roasted him continually over the start of this season. Don’t get me wrong, most of the gags were funny, but they were getting a little bit too much. 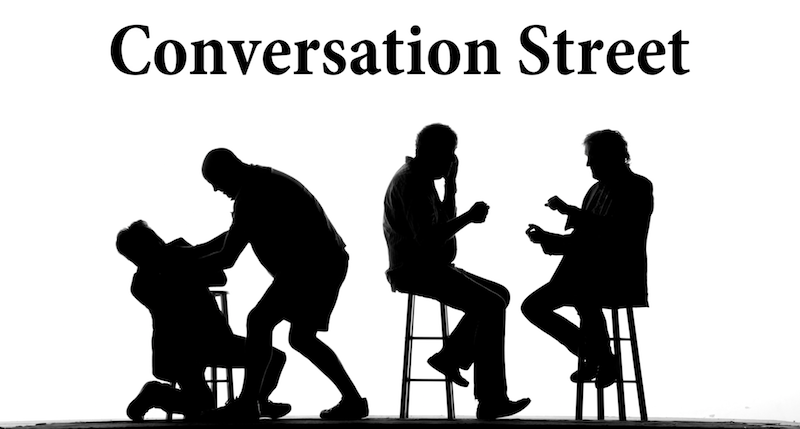 Thankfully they had died down, meaning that when the jokes were delivered tonight they had a bit more potency in this episode’s Conversation Street. One of the topics of discussion was the new Rimac, “What happened to that one?”, Clarkson asked, referring to Concept One. May then asks how many Concept One models were made, to which Hammond states 8, leading May to then ask how many are left. After Hammond bites, stating 7 were left, he then goes on to say that the new model is actually the Concept 2. Clarkson then says he has a picture of it, and delivers it in typical fashion. The trio also discuss the McLaren Senna, and surprisingly none of them discuss its looks, which caused quite the stir when the photos were released. Dieselgate was also discussed as well as the new BMW Z4, which Clarkson says will be no good at taking its jumper off cross-armed. That will make more sense when you watch it I promise. We now move on to main film of the episode in which the trio embark to make an amphibious car to beat the UK speed record. This should be a walk in the park for the GT boys as they have prior experience from their Top Gear days, although I suppose those cars weren’t exactly successful. 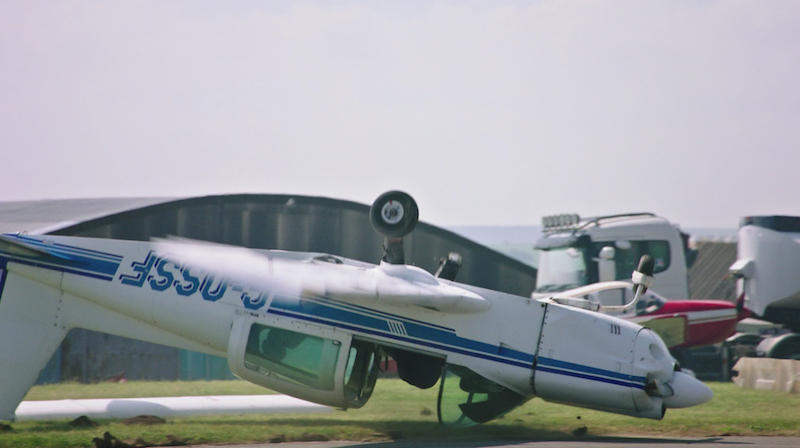 Clarkson with a jet engine, what’s the worst that could happen?! 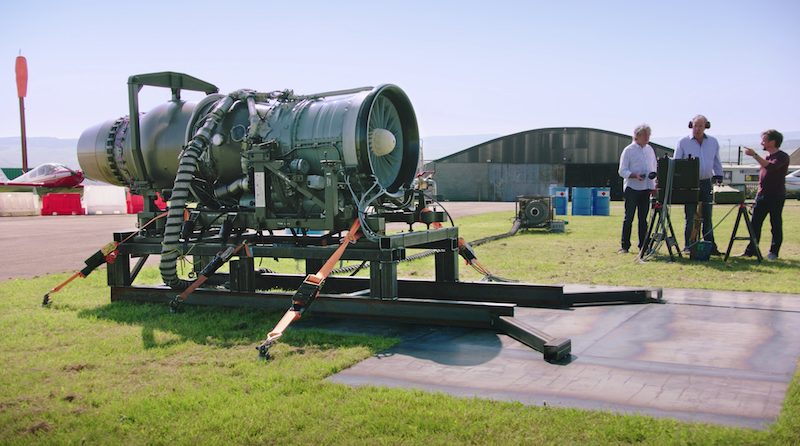 Clarkson comes up with the idea of fitting a jet engine to make the vessel as fast as possible. This sounds predictably insane, but the orangutan tries to win over his colleague by putting on a demonstration at Huddersfield International Airport. Like Clarkson, the jet engine produces a lot of noise and hot air, destroying to light aircrafts in the process. Needless to say Hammond and May are not won over. Despite their reservations, they work on building a craft made from a boat, a Suzuki Jimny… and a jet engine from Russian fighter. This leads Hammond to state that this is the stupidest thing he has ever done, and after having his meat and two veg almost removed by the test drive on the road, he wisely chooses not take part in the aquatic test. He needn’t have worried, as on their maiden voyage, Clarkson and May hit a grand speed of…3mph. Hammond and May decide to go down a different route, a rather radical one at that. They bring in a Bond Bug, which later on in the episode receives the apt nickname ‘Pond Bug’, and plan to use the engine from a jet ski. Clarkson then accuses them of copying their idea, but Hammond and May crack on regardless, which concludes this part of the film. 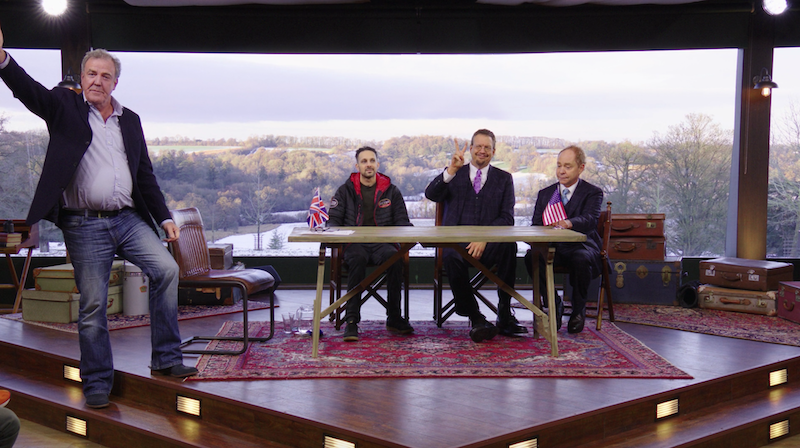 This week on Celebrity Face-Off there were not two, but three hosts, as British magician Dynamo took on American magic legends Penn and Teller. Not a great deal of cars were discussed in the interview, but that was absolutely fine, as that meant more time for magic. Dynamo went first, and after he was done he had Clarkson pretty much speechless, which as well know, is a hard thing to achieve. That in itself is surely magic. Penn and the famously silent Teller also did what they do best and left Jezza equally as dumfounded. With the magic over, we then head out on to the track. Well I say track, it was a massive layer of snow that acting as a race track as the area had obviously been hit hard with snow. Predictably the lap times were far from record-breaking, but it did make for some decent entertainment. 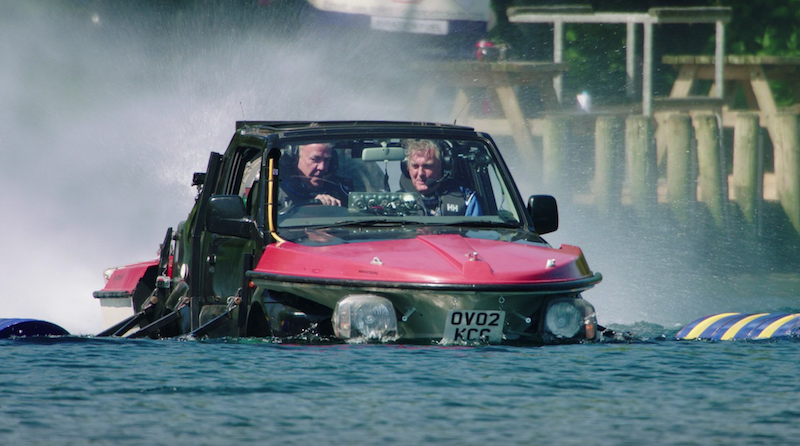 Speaking of record breakers, could Clarkson, Hammond and May break the British water speed record for an amphibious car? We join May looking very chuffed whilst driving the ‘Pond Bug’ in to an event called ‘Coniston Speed Week’. 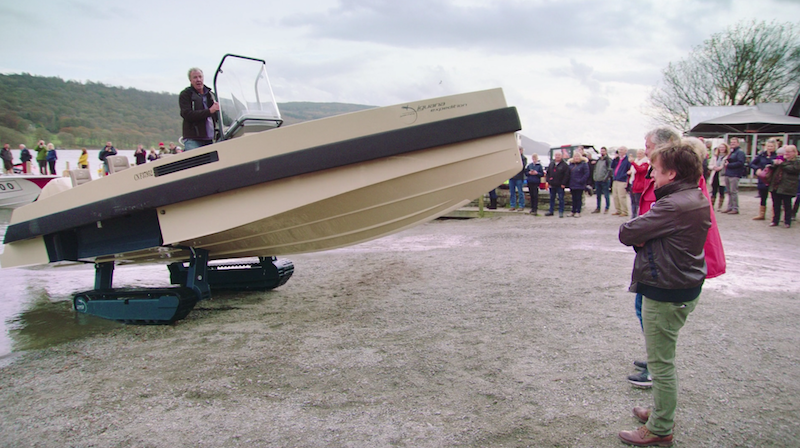 Shortly afterwards, Jezza turns up in what May describes as a “boat with legs”, and it’s clear to see that it’s not an amphibious car, despite Clarkson arguing that it could well be road legal. After Clarkson’s hope of entering his vessel are quickly dashed, Hammond and May show him the magnificence of their work. He predictably mocks it, and criticises their handiwork, making it a bit awkward when the pair reveal they are not able to captain the ‘Pond Bug’ due to the lack of license required. It turns out that Clarkson does have such a license, so despite saying he won’t do it, we cut to the next shot with him sat in it ready to set off. Before he can set off though Hammond and May took him through the laughably complicated instructions to which Clarkson argues that they should not have made it so complicated if they knew that he was going to pilot it. Their counter argument is that they’ve written it all down on a handy A4 piece of paper – well at least it was laminated to keep it waterproof. 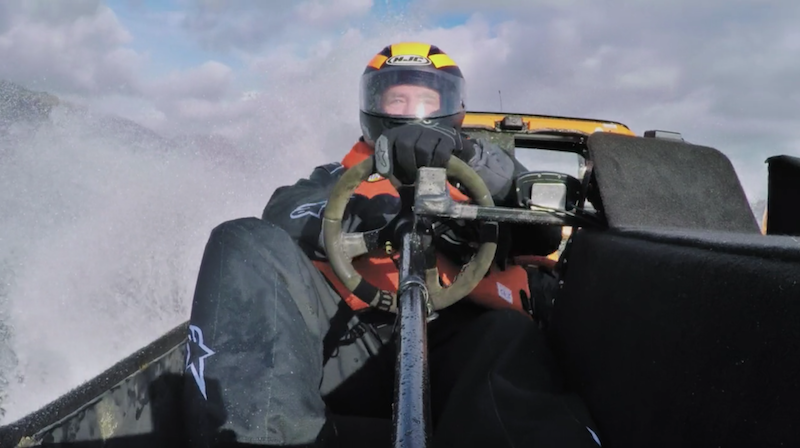 Resigning himself to the situation, Clarkson sets on to the lake and quickly learnt that the steering was…challenging. So challenging in fact, that JC could barely get it on the straight and narrow to start the test in the first place. I’m sure he was ruddy cross at the time, but it certainly makes for good entertainment. 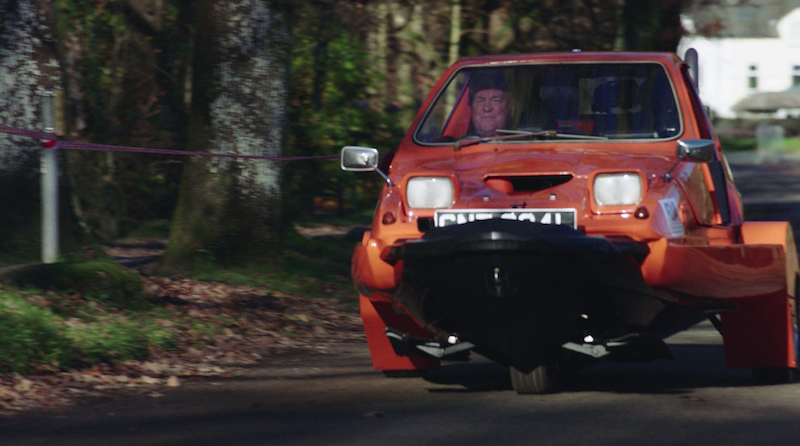 Clarkson describes the ‘Pond Bug’ as a death trap, but was he able to beat the record? I’ll leave that as a surprise, but I can tell you that he did survive! 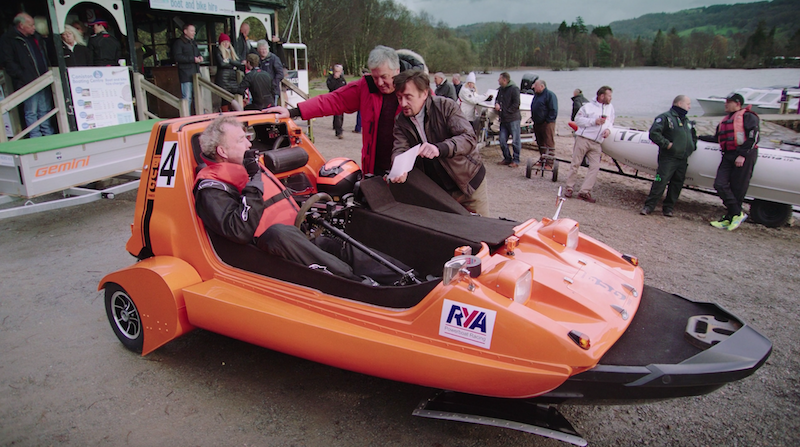 Although this wasn’t one of my favourite episodes of the season, it provided some decent entertainment and I thoroughly enjoyed the amphibious car film, even though it’s basically a recycled idea from the trio’s Top Gear days. The Bugatti/Jaguar film was a good watch and I enjoyed the magic in CFO. Despite this, it just didn’t seem as good as the episode that preceded, it just didn’t wow me as much. A good watch all-in-all though.